Following Shackleton and his two principal companions, Frank Worsley and Tom Crean, dramatic 800 mile voyage aboard the 23 foot whaler or lifeboat the James Caird to South Georgia, they immediately set about the task of securing the rescue of their 22 comrades marooned on distant Elephant Island from their icy prison, where the men had survived on a diet of seal and penguin and mugs of steaming hot gruel, known as hoosh. Between 23rd May 1916 and 31st August 1916 Shackleton made four attempts to return to Elephant Island and secure their rescue. However despite all Shackleton’s efforts the first three attempts were unsuccessful, the rescue boat being beaten back by the ice on each occasion. The fourth attempt was a success, and the hero of that hour was the skilled acting commander of the Chilean navy ship the Yelcho – that man was Pilot Luis Alberto Pardo Villalon (1882-1935). The Yelcho was totally unsuited for the job in hand, having no Radio, no proper heating system, no electric lighting and no double hull – It was Pilot Pardo’s experienced and masterly navigation, that led his ship through the Drake Passage amidst a strong winter storm. He found Elephant island covered in fog but free from icebergs. Trusting his own instinct, Pardo decided to approach the island, confident of a crew composed only of volunteers and relying on the echo that could be heard from his own ship’s siren. Shackleton’s men were rescued that afternoon, and the Yelcho was able to commence the return voyage to Punta Arenas. The welcome they received on arriving at Punta Arenas was unbelievable. Almost the entire population had turned out to welcome them. This was to be nothing compared to the reception they received when the Yelcho arrived at Valparaiso on 27th September. At least 30,000 people thronged around the harbour and nearby streets. Shackleton wrote “ Everything that could swim in the way of a boat was out to meet us “. Captain Pardo was given a hero’s welcome in his home country of Chile and immediately promoted to Pilot 1st class and given several civilian medals and naval honours , including credit for ten years of service for his rescue feat. The British government authorized a large monetary award, which he turned down, stating that he was simply fulfilling a mission assigned to him by the Chilean Navy. After three years service in the Navy, Pardo filed for retirement in 1919. The Chilean government appointed him consul of Chile in Liverpool. This was quite an honour, as at that time Liverpool was the greatest sea-port in Europe if not the world. Luis Pardo held this position between 1930 – 1934. Sadly Luis Pardo died of bronchopneumonia on the 21st February 1935, aged 52 in Santiago, Chile. The task is great, but nothing frightens me: I’m Chilean. Two considerations make me face these dangers: save explorers and give glory to Chile. I’ll be happy if I could achieve what others can not. If I fail and die, you will have to take care of my Laura and my children, who without any support except for yours. If I have success, I have done my duty as a seaman humanitarian and as a Chilean. When you read this letter, or your child will be dead or have reached Punta Arenas with the castaways. I will return not alone. Pardo Ridge, the highest portion of Elephant Island, was named after Luis Pardo, and a cape on the northern tip of the Island was given the name Yelcho. The bow of the Yelcho is on display at Puerto Williams, a Chilean Naval base on the Beagle Channel, and a bust of Captain Pardo has been placed at the site of the Endurance crew’s camp on Elephant Island. Pardo also received the medal of the City of Punta Arenas, the medal Corps Lifeguard Valparaiso , the medal of the Patriotic League of Chile , the medal of the Chilean Society of History and Geography and the medal of the Maritime League of Chile – School of Mechanical also gave a distinction to machinist over the Yelcho, the greatest engineer José Beltrán Gamarra , the 30 of September of 1916. The cutter boat Yelcho was built in 1906 by the Scottish firm G. Brown and Co. of Greenock, on the River Clyde for towage and cargo service of the Chilean Sociedad Ganadera e Industrial Yelcho y Palena de Puerto Montt. In 1908 she was sold to the Chilean Navy and ordered to Punta Arenas as a tug and for periodic maintenance and supply of the lighthouses of the zone. The Yelcho was retired from active Navy duty in 1945, but was still used as a ship’s tender at the Chilean School for Cabin Boys until 1958. In 1962 she was sold off, presumably for scrap. 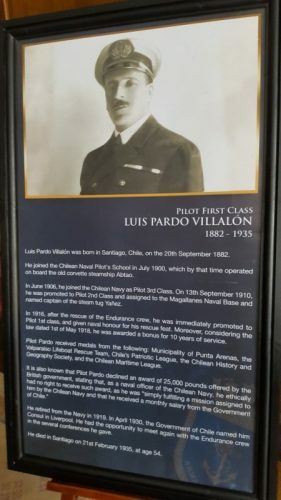 Luis Alberto Pardo Villalon – Captain Pardo entered the Chilean Naval Pilot’s School in July 1900, and joined the Chilean Navy as a Pilot 3rd Class in June 1906. He was promoted to Pilot 2nd class in September 1910, and assigned to the Magallanes Naval Base in southern Chile as captain of the steam tugYelcho. Captain : Luis Alberto Pardo Villalon. 2nd in Command : Leon Aguirre Romero. Chief Engineer : Jorge L. Valenzuela Mesa. 2nd Engineer : Jose Beltran Gamarra. Engineers : Nicolas Munoz Molina and Manuel Blackwood. Firemen : Herbito Cariz Caramo. Juan Vera Jara. Pedro Chaura. Pedro Soto Nunez. Luis Contreras Castro. Guard : Manuel Ojeda. Ladislao Gallego Trujillo. Hopolito Aries. Jose Leiva Chacon. Antonio Colin Parada. Foreman : Jose Munoz Tellez. Seamen : Pedro Pairo. Jose del C. Galindo. Florentino Gonzalez Estay. Clodomiro Aguero Soto. Cabin Boy : Bautista Ibarra Carvajal.